Machining of the fork ends, final boring of the holes and fitting of bushes to the cross stays continues. Machining of the axleboxes is starting. An arrangement of dummy axles has been made in order to assist in correctly aligning the axleboxes within the horn blocks and horn guides. Reaming of rivet holes at the rear end of the chassis continues. The material has been obtained for making the cold turned rivets. The wooden framework attached to the lifting gantry for the storm sheet has been renewed in preparation for the winter weather. 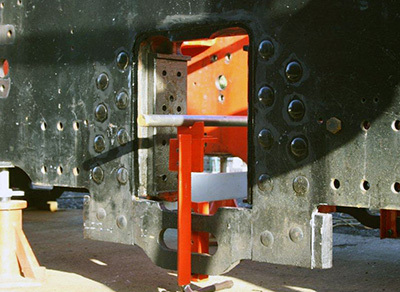 Information has been received that the new cylinder, cast from our patterns, for 76079 on the North Yorkshire Moors Railway has successfully passed a hydraulic pressure test and is now to be fitted to the locomotive. This news has been forwarded on to Cerdic Foundries in order that they can proceed with casting the cylinders for 82045. RCTS magazine The Railway Observer carried an article by Chris and an appeal leaflet in its November issue. The magazine has a limited circulation, but results at the time of writing have been encouraging. 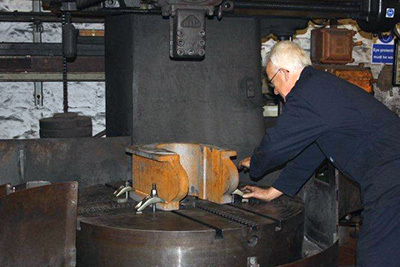 The money raised is being used to conserve the Wheel Appeal: the complete driving wheel job is in the bag, but we need to keep the wheel account in a healthy state in order to pay for the pony wheels and pony truck assemblies, work on which is under way. We have a raft of ideas ready for the launch of the Boiler Appeal in the early spring, starting with an article and leaflet insert in SVR News. Appeals will be phased throughout 2014, so that we can take full advantage of the photogenic potential of 82045 as a rolling chassis with cylinders fitted. Don't forget that the Boiler Account is already open for business if you feel like stealing a march on everyone else! 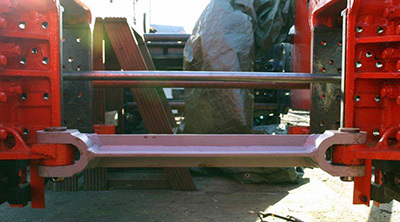 We already have enough to purchase the two boiler barrel sections, and hope very much to be able to keep up the pace in anticipation of the hard slog to raise funds for this, the most expensive part of the build. It's always dangerous to be too optimistic about completion dates; but we are cautiously starting to feel that - given a fair wind - the engine could be finished by 2017, a most appropriate year since it marks the fiftieth anniversary of the withdrawal (in July 1967 at the end of steam on the Southern Region) of nos 82019 and 82029, the last two working members of the class. Remember that this remains an ideal, but a realisable one given enough support from SVR members and from the wider enthusiast fraternity. 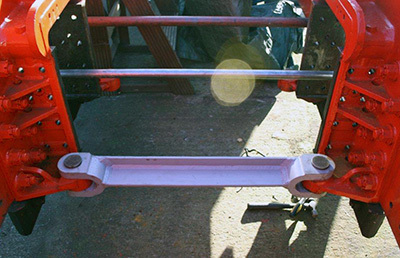 The dummy axle arrangement used to assist getting the axleboxes correctly positioned within the horn blocks and horn guides. One of the cross stays in position between the horn blocks, dummy axle behind. Another view of a cross stay in position between the horn blocks. 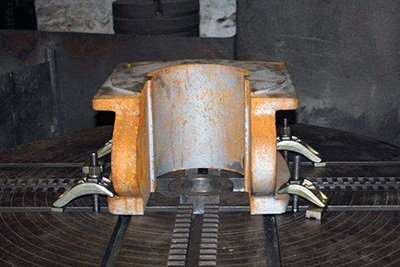 An axlebox on one of the vertical boring machines preparatory to the start of machining. Richard Fraser setting up an axlebox on one of the vertical boring machines in preparation for machining.